Description: I miss these locos. Description: Westbound passing under the old Pennsy signal bridge at Racine Ave. Description: Less than three months from retirement, Metra 614 leads Milwaukee District West Line train #2231 as it pulls away from the Itasca station on May 17, 2004. Description: Only a few weeks from retirement, F40C 614 trails new MP36 423 on Milwaukee District West Line train #2231 as it rolls into Bensenville on July 7, 2004. Description: After nearly six months in retirement, Metra 614 is back in revenue service as it leads Milwaukee District West Line train #2707 into Franklin Park. Description: During a brief return to service, semi-retired Metra F40C 614 pauses with Milwaukee District West Line train #2714 at Elgin's National Street station. 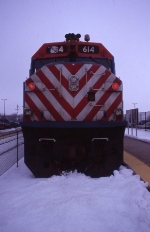 Description: Pressed back into service after five MP36 locomotives died in a snowstorm, Metra 614 is assigned to Milwaukee District West Line train #2714 on a gray and snowy Jan. 8, 2005. Description: After nearly six months in retirement, Metra 614 makes an appearance at the Elgin coach yard. Description: Seen here in the Elgin coach yard, Metra F40C 614 doesn't look too shabby for a locomotive that has been out of service for half a year. Description: The 614 is out for a test train that will run on Sunday. Description: It is great to see this wonderful locomotive running again even for one day. Description: metra 614 114 and 422 in fox lake yard what looks better?